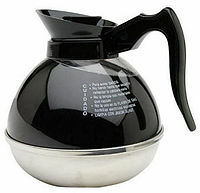 The classic coffee pot, many of which were outlawed by the regulations. The Hyper Text Coffee Pot Control Protocol was an internationally recognised protocol introduced in 1998 that monitors the manufacturing, distribution, and pricing of coffee pots. It was created after many reports from avid coffee-junkies that cheap Korean coffee pot imports were ruining their hourly coffee - in extreme cases giving them the terrible affliction of sleep for the first time in decades. It was widely praised in all Western countries, especially Belgium, when it first came out. This was due to its strict regulations and refusal to pander to universal equality merchants which meant better coffee for the end user. However, by 2001, its following was diminishing, due to many patented ways around it (and sometimes through it, although that wasn't always as nice an experience for the crook). The declining consumption of coffee in favour of the rapidly expanding energy drink market also contributed to the protocol's demise. It was finally deprecated in 2002. There was a need for tight coffee regulations as far back as 1991, the start of the overseas coffee boom. People were eschewing their bland old local coffee pots and were importing from such luxurious places as China. This was a problem for Governments of the old C8, which composed of the most powerful coffee pot making countries of the world — Britain, America, Brazil, France, Germany, Spain, Russia and, oddly, Papua New Guinea. These Governments were losing money from cheap Far Eastern knock-offs of their products, which their subjects were buying with much more abundance than the expensive home-produced versions. The Governments of these countries proposed a rule outlawing people from buying pots from countries other than their homeland, but that was defeated due to the recent fall of Communism, and the public outrage of anything looking like it. So they went back to the drawing board...and forgot about for seven years. Then, a bored intern told one of the Government's leaders to go on a power trip. Said leader thought this was a good idea, and decided to let a crack team of internet nerds (the IETF, in this case) impose as tight a restriction on coffee pots as was humanly possible. When put to a poll, this measure passed with a majority of seven, with the Papua New Guinea vote being construed as "Uha Uha Vana Uha", and thus discounted. A compliant model. Note the electrical gubbins needed to pass the emissions test. The HTCPCP was first implemented on April 1, 1998, when it was included in the Internet Engineering Task Force's monthly memo (codenamed WELVCFFN 2324). Some of the world's coffee drinking population thought that the new rules were a joke, as suggested by the date the memo was released. However, these people would later be shocked to see, next time they had to replace their favourite pot, that on each box there would be a stamp. This stamp - in lurid red and black - would tell the customer that the pot had conformed to all of the HTCPCP's regulations, many of which had no relation to serving good coffee. The HTCPCP was known for its extremely strict (for the time) regulations. It required the BREW or POST commands of a pot, which allows it to brew coffee, to be cleaned up so that it met caffeine emissions laws - this was intended to weed out Far Eastern imports, but ended up hitting well-known companies, too. This is thought of by a deranged few to be the start of the environmental age, as it precludes by a fair few years the mad rush to be green. 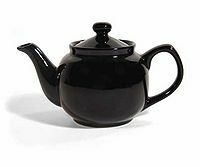 One of the errors coded into the HTCPCP was Error 418 - "I'm a teapot". 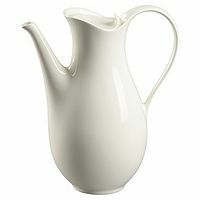 The error message contained said, "The HTCPCP server is a teapot. The responding entity may be short and stout." The regulations, cruel as they were, were widely accepted by masochistic coffee lovers the world over, and by 1999, all coffee pots in existence were following the regulations. By early 2000, though, the top coffee-crackers had found ways to manipulate coffee pots so that they looked like they followed the regulations, but tiny tweaks in their manufacture meant they actually had no concern for them (not that coffee pots feel concerned anyway, but that's beside the point). The coffee authorities were authorised to kill the perpetrators, but unfortunately they were too busy answering the calls of illegal coffee pots, and thus trying to decipher what they called "coffee pot speak", to be able to track them down. By 2001, it was clear that new legislation was needed. Crack pots were outselling legal ones by 16-to-1, and the crackers had figured out a way of installing a red light to a pot, that, when turned on, deactivated the pot to the point where the crook could use it to fuel his misanthropic needs. The Governments of various countries started talking about this, seeing it as an urgent mission way more important than thwarting terrorism or funding the soon to be re-ignited Iraq War, and in early 2002 coffee pots saw a reclassification, branding them "Dangerous drug suppliers", allowing them to fall under the new Beverages and Drugs Act, which supplanted the HTCPCP. People the world over cheered at the realisation that caffeine was now illegal. However, the B&D was, at the petition of some very addicted mentalists, changed to allow the use of caffeine at homes. No one knows why, though some guess it was because the addicts didn't care about anything other than getting their sweet, euphoric caffeine. For those without comedic tastes, the so-called experts at Wikipedia think they have an article about Hyper Text Coffee Pot Control Protocol.